The products are designed to make your A/V device use more convenient, comfortable, productive and cost-efficient.The HDMI coaxial extender can do digital coding processing for HDMI signal with DTV technology. The product adopts RF modulation technology characteristic to transmit the Multiple RF signal through one common coaxial cable (SYV-75/RG59) for long distance transmission without amplification. The receiver can restore the high-definition video signal and transmit it to the TV or monitor. By adding DTV network mixer at the RF cable, you can easily achieve many kinds of transmission mode, e.g. signal split, switch and matrix. Our devices offer solutions for noise, space and security concerns, data center control, information distribution, conference room presentation, school and corporate training environments. Contains a HDMI transmitter (TX) and a HDMI receiver (RX). The TX supports a HDMI input and the RX supports a HDMI output. Support HDMI resolution up to 1080P/60Hz. Transmission distance up to 500 meters by SYV-75-5 coaxial cable and no need amplification. 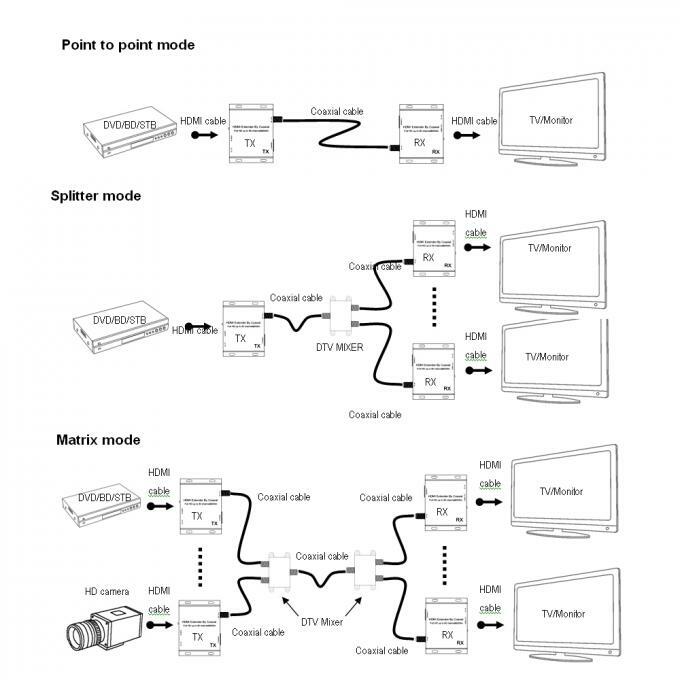 Adding digital TV network mixer in RF cable, can easily achieve many kinds of transmission mode, e.g. signal split, switching and matrix. Support 100 channels for option; frequency ranges 50MHz~950MHz. 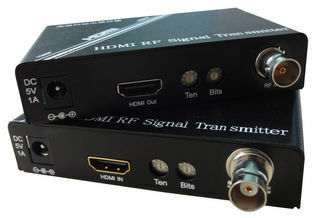 Products using the broadcast signal transmission mode, only one line can transmit over 48 channels of high-definition video signal at the same time. The use of digital TV communication protocol, anti interference and error correction capability is very strong. Installs in minutes. Analog monitor system upgrade to HD systems can continue to use the original connector and cable. Contains a transmitter (TX) and a receiver (RX). The TX supports a HDMI input and the RX supports a HDMI output.